Only a few hours away from Manhattan, during the same opening weekend as the Tribeca Film Festival, a group of artists and audiences from around the globe gathered together in Boston for the fifth year in a row. Why do so many up-and-coming filmmakers (several from NYC) choose to spend their time here? It’s because the annual Independent Film Festival Boston (IFFB) has accomplished more in its five-year history, than some festivals do with twice as much time and resources. “The main reason we wanted to start the festival was because of our dissatisfaction with the Boston Film Festival,” says Program Director Adam Roffman, comparing his relatively intimate and accessible operation to its 23 year-old Beantown rival. Roffman (a propmaster for studio films during his off-season) came onboard the inaugural year, when Executive Director Jason Redmond felt he could bring some of his film industry connections and insight to the start-up event. And, in a very short period of time, IFFB has become a favorite stop for filmmakers on the increasingly hectic springtime regional circuit. With its proximity to New York City, the Independent Film Festival Boston manages to attract many filmmakers in search of a chance to get away from the five boroughs for a few days. “Pretty in the Face” director Nate Meyer (who is based in New York) landed in Boston following back-to-back awards at both the Florida and Sarasota Film Festivals (as well as a premiere at SXSW). With a handful of festivals still scheduled for his relationship drama, Meyer enjoyed the opportunity to screen in Boston for his Northeast Premiere. 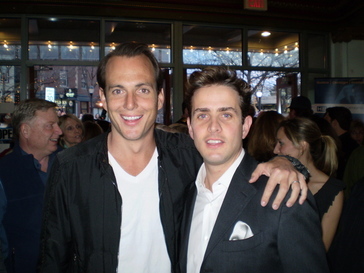 Joey McIntyre and Will Arnett attend the world premiere of their Boston-set comedy, “On Broadway,” at this year’s Independent Film Festival Boston. Photo by Matt Dentler. With a glance at the lineup, fest veterans can identify some familiar titles (Joe Swanberg‘s “Hannah Takes the Stairs,” Craig Zobel‘s “Great World of Sound,” etc.) sprinkled with the occasional world premiere (Michael Corrente‘s Closing Night Film “Brooklyn Rules“). It certainly did not go unnoticed that one of IFFB’s biggest draws was the premiere for locally-made comedy, “On Broadway,” directed by Dave McLaughlin. Starring pop singer (and Beantown native) Joey McIntyre, the film’s premiere forced a traffic jam outside the Somerville Theatre on Thursday night. Mayor Thomas M. Menino was among the many Boston luminaries in attendance. “We want to play a vital part in reviving the Boston film scene,” claims Adam Roffman, a few days into the festival, about a community that is often overlooked in favor of New York. For example, this year’s Best Picture Oscar winner, Martin Scorsese‘s “The Departed,” is set in Boston but famously filmed most of its interiors in the Big Apple. Unlike some regional festivals, IFFB balances an energetic and accessible location, with quality programming. Many filmmakers and festival veterans spent their time at IFFB not so much discovering new films, but catching up on circuit favorites such as Sarah Polley‘s “Away From Her” or Laura Dunn‘s “The Unforeseen.” In the heated landscape of festival premiere politics, it’s refreshing to see a festival choose quality over quantity. And, that likable ease often translates into the festival experience. “Screenings here have been nuts,” commented “Monkey Warfare” director Reg Harkema, who has traveled to several festivals, since premiering in Toronto last September. In Boston, Harkema has received help from local Canadian organizations, which recently honored two of his stars, Don McKellar and Tracy Wright, shortly before the festival. Independent Film Festival Boston Executive Director Jason Redmond, left, with Program Director Adam Roffman, on Thursday night at the fest. Photo by Matt Dentler. “The U.S. festivals I’ve gone to have almost been more excited about these new Canadian films than some of the Canadian film festivals,” Harkema adds. IFFB slotted a handful of well-attended panel discussions over the weekend. 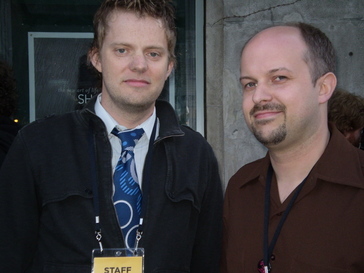 They included how-to sessions for filmmakers by filmmakers, featuring IFFB vets such as David Redmon and Ashley Sabin (“Kamp Katrina“) and Michael Tully (“Silver Jew“). Plus, the festival hosted a panel on non-theatrical distribution, which featured Indiepix‘s Danielle DiGiacomo and OurStage‘s Ben Campbell. Panel attendees (primarily local filmmakers and performers) crowded the sessions, eager for advice. Nevertheless, a fledgling fest like IFFB is not without its setbacks. Attendance for most screenings is rarely standing-room-only, unless the film has a local connection (“On Broadway”) or a wealth of pre-fest publicity (David Wain‘s “The Ten“). Plus, the festival hotels are located around downtown Boston, while the festival is based in nearby Somerville. In support of guests, though, IFFB provided subway passes for the 30-minute ride to and from events. At the festival’s Sunday night awards ceremony, organizers presented jury prizes for Best Narrative Feature (Julia Loktev‘s “Day Night Day Night“), Best Documentary Feature (Seth Gordon‘s “King of Kong“), and Best Short (Moon Molson‘s “Pop Foul“). Special Jury Prizes for those three categories, were awarded to: “Monkey Warfare,” “Kamp Katrina,” and John Thompson‘s “Songbird,” respectively. The Dewar’s Collective Choice audience award was presented to David Kaplan‘s “Year of the Fish.” Steve Collins‘ “Gretchen” won the Apple Programmer’s Choice Award. As for the future of IFFB, Roffman and company have their sights set on expanding the already solid program.